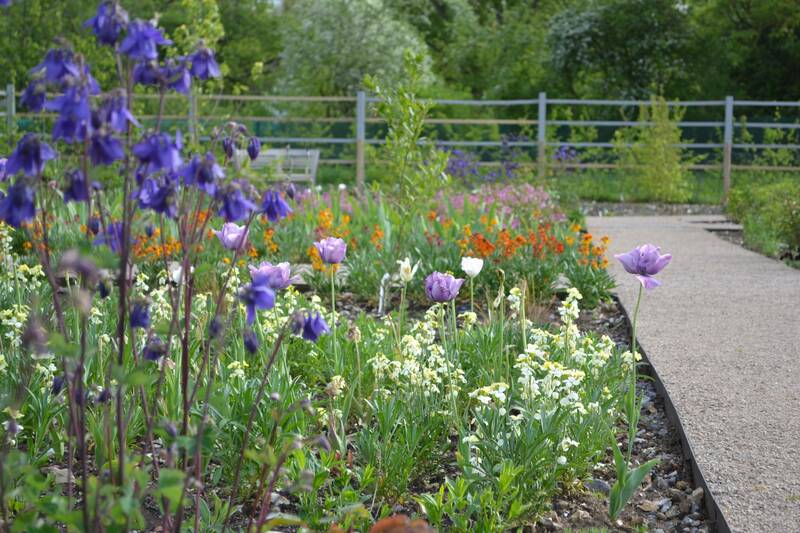 Keyneston Mill Botanic Gardens lie in the Tarrant Valley, bordered by the River Stour. The formal Collection Gardens have been designed in “compartments” each featuring plants from a different perfume family for example Floral, Fougere (Fern), Spice and Citrus. Beautiful and gloriously scented, these gardens are also practical trial beds where unusual varieties are grown and distilled in small batches. Those that produce great oil may then be planted in the surrounding Perfume Crop Fields which form a patchwork of colour in summer – the vital botanical ingredients, exclusively for inclusion in Parterre perfumes. Find out more about scented plants and perfumery by joining one of our regular guided tours (hyperlink). “Knee-deep in a field of vetiver grass, a waft of lavender in the air, I can’t stop crushing my handful of bergamot mint and inhaling its lemony zing. If you think this sounds like sunny Provence, think again. I’m in Dorset, 20 minutes from Poole …. and Dorset is being hailed as the new Grasse. This game-changing enterprise spearheads a new breed of perfumery, British fragrance, home-grown and home-bottled”. The key ingredients for all Parterre Fragrances are grown and distilled at Keyneston Mill. From seeds & seedlings, through planting in the Perfume Crop Fields, to harvest and distillation. The intensity of fragrance is achieved through nurturing of the plants and picking at the optimum moment. Most plants, such as rose geranium, are harvested in the early morning and taken directly to the distillery, resulting in essential oils infused with freshness. Others, like vetiver root, are dried before distillation, a process that takes several days and produces an extract of rare depth and richness. Once the extracts are ready, they are taken to Master Perfumer, Jacques Chabert at his laboratory in Grasse, where he and his daughters incorporate the rare and unusual essential oils in the Parterre perfumes, using both skill and artistry. The result is outstanding, beautifully crafted fragrances. You can find out more about perfume creation by joining us for a Perfume Workshop at Keyneston Mill. All Parterre perfumes are true limited editions because each year we produce only a limited amount of the finest oils that form the key notes. A finite number of bottles of perfume is created from each “Extraction”. Distillation takes place throughout the year with leafy plants taking centre stage in Summer, while roots and seeds are the focus during the winter months. Tours offer the chance to learn more about the distillation process, the unusual plants we grow, and the opportunity to smell some of the precious, high quality oils we produce on site!